Home -> My dog LOVES to dig, and that’s ok! My dog LOVES to dig, and that’s ok! My dog LOVES to dig! 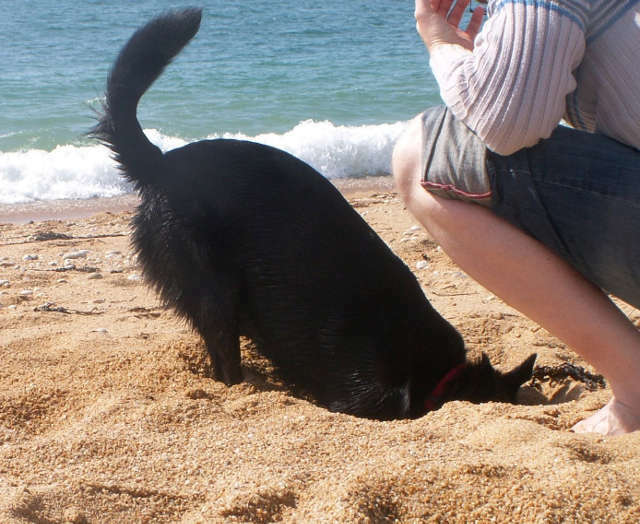 When I’m out and about on the beach with my dog, people often approach me when they see her happily digging huge holes in the sand. Some just laugh and obviously enjoy watching her busily landscaping the strand. Others seem to be rather concerned about her behaviour and the fact that I don’t prevent her from doing so. Their main concern is whether I’m not worried that she may indulge in the same activity in my garden. And here is the thing: NO, I’m absolutely not! As you may have already noticed dogs don’t generalise things well. For example, if your dog has learned how to sit nicely in the kitchen – because you did a lot of training with her in the kitchen – it doesn’t automatically imply that she knows the meaning of “Sit” in the garden, on walks or at your friend’s house, unless she had time to practice this behaviour in many other places other than your kitchen. I hope you can now see why your dog won’t learn to dig up your garden just because you allow her to enjoy doing so in appropriate places. On the other hand, however, if you leave your dog in the backyard unattended for extended periods of time, she may get bored and have sufficient time to practice digging up your garden. Break the habit by preventing access to her favourite digging spots. She won’t learn new ways while she has free access to them. Supervise to prevent mistakes and provide her with plenty of mental stimulation (chew toys, food dispensing toys, training games, etc. ).